Imagine a house that recognizes your face and opens the door, so you’ll never get locked outside. A house that you can remote control from anywhere in the world with the swipe of a touchpad; a house that senses leaky pipes, alerts you, and automatically turns off the tap. Intel, Minim Homes, and Kyle Schuneman just unveiled the Smart Tiny House of the future in San Francisco – and it manages to pack all of these features into 264 square feet of airy, light-filled living space. 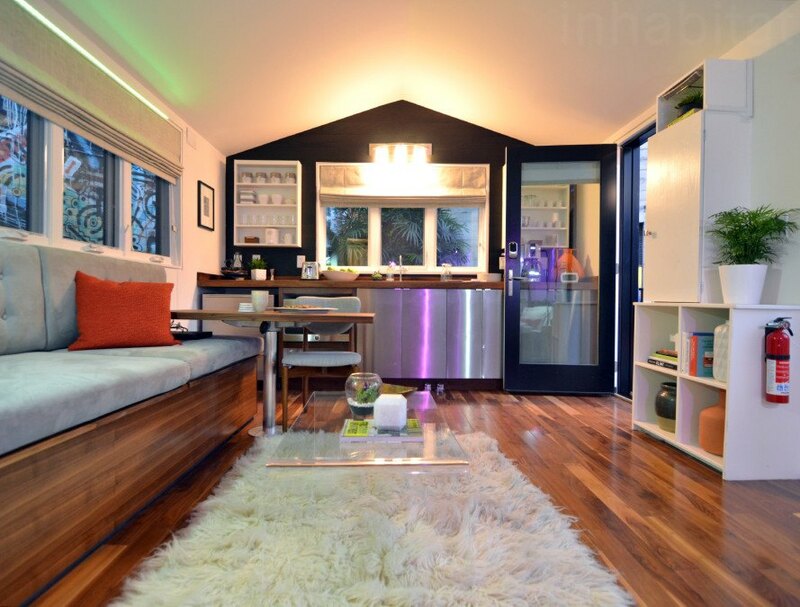 Tiny houses and smart homes are two of our favorite things. Combine them and you’ve got Intel‘s Smart Tiny House – a futuristic, fully-automated residence that maximizes living space. Most tiny homes are light on technology – there simply isn’t enough room to cram in bulky appliances and gadgets. Intel’s Smart Tiny House is the exception. The home was designed and built by Minim Homes with open, multifunctional spaces, and tiny house designer Kyle Schuneman incorporated transforming furniture (the bed rolls out from beneath the office space) and hid all the wiring in the walls. The result is a spacious and livable home with a footprint tiny enough to be transported on a trailer. The brain of the house is Intel’s new Internet of Things Platform for connecting and controlling smart devices. It basically allows you to control all of a home’s systems from a single tablet app – you can swipe a slider to adjust the thermostat, change the color and brightness of the home’s lighting, and even open the door for a repairman while you’re away. Older non-connected appliances can also be controlled using smart outlets. All of the systems respond to voice control, and the platform is capable of learning your living habits to make intelligent decisions based on your behavior. Some of the systems (like the facial recognition door lock) didn’t work perfectly the first time, but Intel calls the project a “Living Lab” – so it should evolve and improve over time. It’s an exciting time for smart homes as the Internet of Things matures, and we can’t wait to see what’s next. Its nice to see old technology making its way to tiny homes. I designed the smart home in 1980, along with the pad too. But we didnt have the technology for the pad, just sensors and simple devices for voice and alarms. I also included a button for starting your car in the am, that technology had just come out! Its funny, my whole project, code and all was never returned by the professor. I designed the pad to also read books, any books, and to handle lists and voice commands. It could be used to attach to your refrigerator, or taken with you to read a book while at the beach, or in a hospital. Its nice to see it all available today. Imagine a house that recognizes your face and opens the door, so you'll never get locked outside. A house that you can remote control from anywhere in the world with the swipe of a touchpad; a house that senses leaky pipes, alerts you, and automatically turns off the tap. Intel, Minim Homes, and Kyle Schuneman just unveiled the Smart Tiny House of the future in San Francisco - and it manages to pack all of these features into 264 square feet of airy, light-filled living space. Tiny houses and smart homes are two of our favorite things. Combine them and you've got Intel's Smart Tiny House - a futuristic, fully-automated residence that maximizes living space. Most tiny homes are light on technology - there simply isn't enough room to cram in bulky appliances and gadgets. 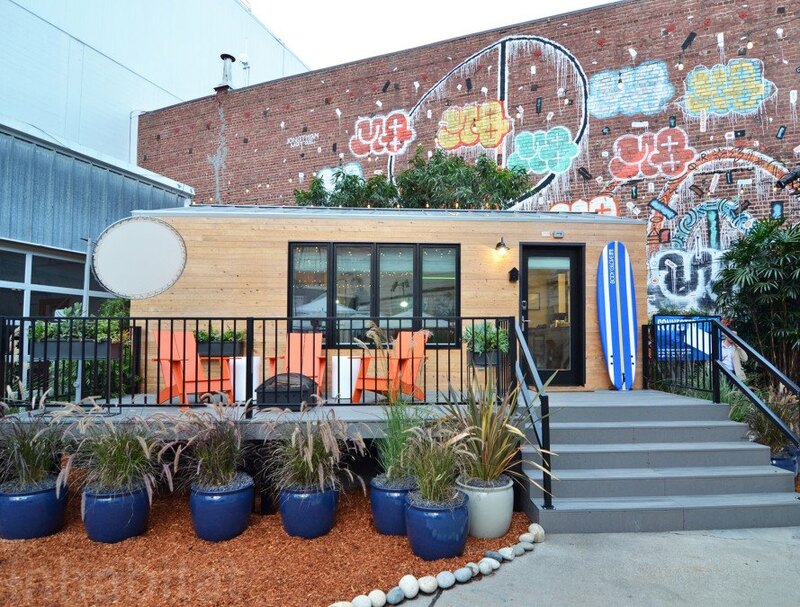 Intel's Smart Tiny House is the exception. Tiny house designer Kyle Schuneman managed the feat by focusing on open, multifunctional spaces, incorporating transforming furniture (the bed rolls out from beneath the office space), and hiding all the wiring in the walls. The result is a spacious and livable home with a footprint tiny enough to be transported on a trailer. The brain of the house is Intel's new Internet of Things Platform for connecting and controlling smart devices. It basically allows you to control all of a home's systems from a single tablet app - you can swipe a slider to adjust the thermostat, change the color and brightness of the home's lighting, and even open the door for a repairman while you're away. Older non-connected appliances can also be controlled using smart outlets. All of the systems respond to voice control, and the platform is capable of learning your living habits to make intelligent decisions based on your behavior. Some of the systems (like the facial recognition door lock) didn't work perfectly the first time, but Intel calls the project a "Living Lab" - so it should evolve and improve over time. It's an exciting time for smart homes as the Internet of Things matures, and we can't wait to see what's next. The Smart Tiny House's kitchen backsplash is made from reclaimed wood. 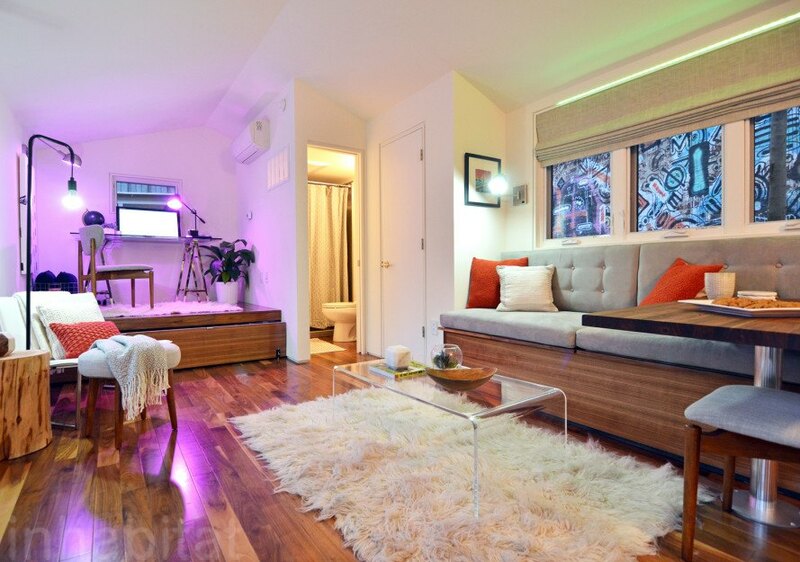 The Smart Tiny House's flexible living area. A camera recognizes your face and unlocks the door automatically. All of the home's systems can be controlled from a tablet. A water sensor automatically detects leaks. The Smart Tiny House's office.